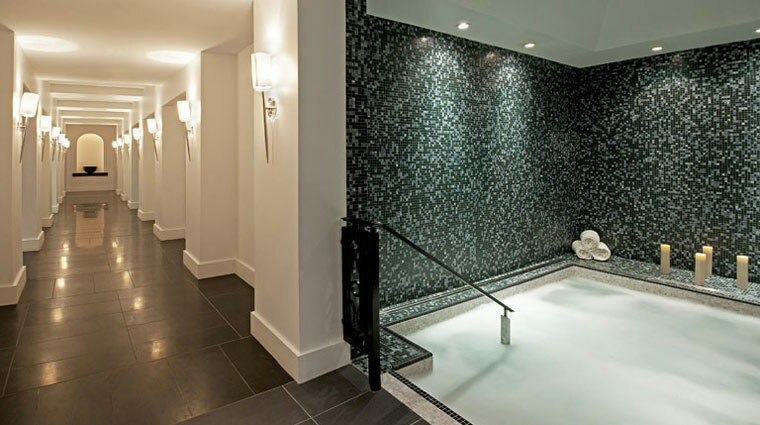 The beautiful, Greek-inspired Waldorf Astoria Spa & Health Club Chicago resides inside the Waldorf Astoria Chicago hotel and features a mosaic-tiled lap pool and expansive changing room lined with white stone, lacquered lockers and rich walnut wood. A full menu of services ranges from pampering massages to age-defying facials. Those looking for the works should book the signature two-hour Waldorf Cleanse; inspired by hammam skincare practices, it includes a coffee, olive stone and lemon scrub, a rhassoul clay cocoon wrap, and a body, scalp and face massage. • Centered on providing personalized services and comfortable luxury, your therapist will be able to incorporate multiple techniques into your treatment based on what your particular needs are and where your pressure points and tension lie. 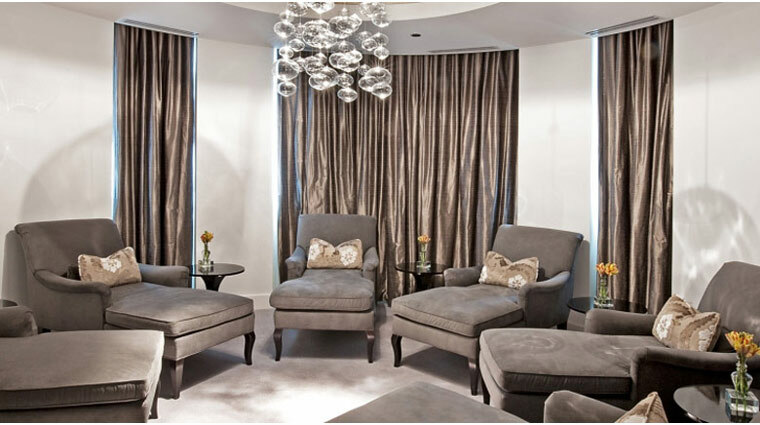 • The waiting area sets a luxurious and intimate tone with velvet settees with sheer curtains allowing for a bit of privacy. • The spa itself features a contemporary atmosphere that still evokes the classical idea of a spa as a meeting space. • Bath services add another element to the already extensive list of treatments the spa offers in-room. These services include the homeopathic detox water cure, renew water cure and calm water cure, as well as a rose bath with a cooling eye treatment. • Everything that the Chicago retreat uses in its treatments is available for purchase in the spa’s boutique, with the exception of the custom Amrit oils the spa uses for its massages. • The spa requires kids to be 16 years old for facials and 18 years old for massages. Younger kids can have treatments done in-room, including the Ice Cream Manicure and Ice Cream Pedicure, Nail Art (which puts on rhinestone), a Mini Facial, and a massage. • You can even schedule swimming lessons in the family-friendly spa’s lap pool. 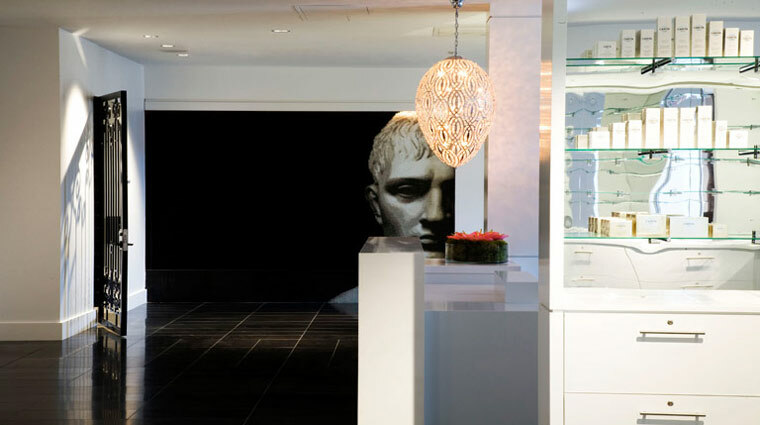 • If you’ve booked a stay at Waldorf Astoria Chicago and didn’t bother to set up an appointment for a massage, but still want to indulge in the Four-Star spa’s facilities, not to worry: The concierge staff can get you into the spa last minute, based on availability. • Generally speaking, the spa has more appointments on weekends than during the week, so it’s best to call ahead to reserve your time slot and appointment with the spa. • And if you can’t get in at the exact time you’d like, you’re more than welcome to enjoy the spa’s gym, pool and heat treatments, which include a whirlpool, sauna and steam room in both the men’s and women’s locker rooms. • If you like hot stone massages, then we suggest you try the knot-busting lava shell massage. They’re heated from the inside out, so they can soothe and relax your muscles through the entire massage. • The results-driven age-defying facial includes five steps: cleansing, exfoliating, a moisturizing peel, mask application and hydration. The entire facial is customized to what your skin needs. • Ashiatsu massages involve bars over the head for balance as your therapist glides over your body in a push-and-pull motion. • The most luxurious hand and foot treatment, the signature manicures and pedicures include the traditional parts of a nail service plus a hot lava shell massage and a paraffin dip. • During the unique muscle repair body treatment, you’ll be wrapped in warm towels to heat up your muscles, then massaged with arnica gel and oil, a natural remedy that helps relieve muscle soreness and promote healing. • Amenities at this plush sanctuary are among the best you’ll find in any spa in the city. • Whether you choose to partake in them before or after, the heat amenities will help relax you even more when combined with any treatment. The spa boasts separate whirlpools, saunas and steam rooms for men and women in each locker room. • Affectionately referred to as the “Man Cave,” thanks to the flatscreen TV with a bevy of sports and news channels, the men’s relaxation lounge has a cozy fireplace and plush leather chairs. • The slim pink mosaic-tiled pool has its own room with cushioned built-in benches for relaxing on one side and chaise lounges at the end of the pool. Just enough light filters in from the windows to create a serene, calming space that’s perfect for a dip or just lounging around reading magazines. • You’ll find all the toiletries you will need in the locker room, plus plenty of various sized towels and smart rubber sandals for the heat treatment and shower areas. Lockers are roomy and there’s plenty of space to move around.